Made of thick 18 gauge galvanised steel: the Centurion weighs over 35 stone! Secure 5 point locking system. The Centurion has an Integral Metal Base which is bolted to the floor for extra security. The Centurion has a great range of accessories available. – See Below. Need A Bigger Centurion Shed? Tough, durable plywood flooring for the Asgard Centurion unit. (Front bay) 18mm x 1449mm x 1003mm. (Back bay) 18mm x 1449mm x 1047mm. Shelf set with lockable unit to sit between top two shelves. Suitable for Centurion, Trojan, Classic and Compact units. Benefits Of the Asgard Centurion large metal shed 5x7 ? Great for storing larger items such as sit-on mowers, quad bikes, garden furniture, BBQ's, garden antiques etc. The Centurion metal shed measures approx.. 7' 3" deep and 5' wide, Weighing 255kg (over 35 stone) - it's a big shed! 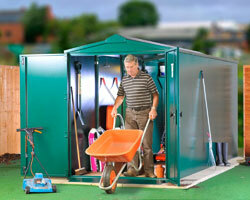 The perfect choice if you need a large and secure metal shed for your garden.